Spit 'n Polish Coin-cleaning Emulsion, 4oz bottle. 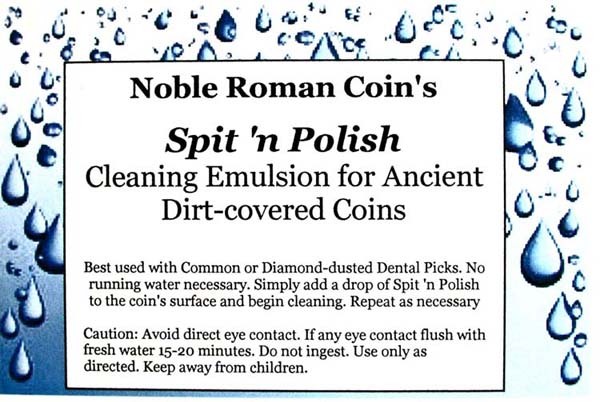 Only available from Noble Roman Coins, this yucky emulsion is perfect for cleaning your dirt-covered coins. 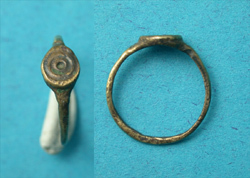 From the beginning of time (or at least for the last 20 years, anyway) we've touted the benefits of cleaning dirt-covered ancient coins with simple saliva and a common or DD Dental Pick. Just a dab of your spit/saliva on your coin's surface keeps the removed dirt in a suspension, so you can actually see what and how much dirt is being removed. Make sense? With this new 'similar-to-spit' emulsion, you'll receive the added benefits of a dirt-penetrating light soap that helps cut into the dirt (unlike your saliva) and at the same time impregnates your coin's green patina, giving a deep rich waxed look, without even buffing. And that's what we're talking about! Best used on coins already soaking in distilled water. Just add a single drop of NRC's Spit 'n Polish to the area you're cleaning and go for it!